Kurlee Belle: Mommy & Me Giveaway Presented by Kurlee Belle & The Good Hair Blog! Mommy & Me Giveaway Presented by Kurlee Belle & The Good Hair Blog! We wanted to show our appreciation for all the mommies out there by doing a special giveaway. *You must be a mommy. *Follow "TheGoodHairBlog" and "KurleeBelle" on Instagram and subscribe to our blogs: www.thegoodhairblog.com and www.kurleebelle.blogspot.com. *Post a picture of yourself and your darling little one/ones with the hashtag #mommymeKBTGHB on Instagram. 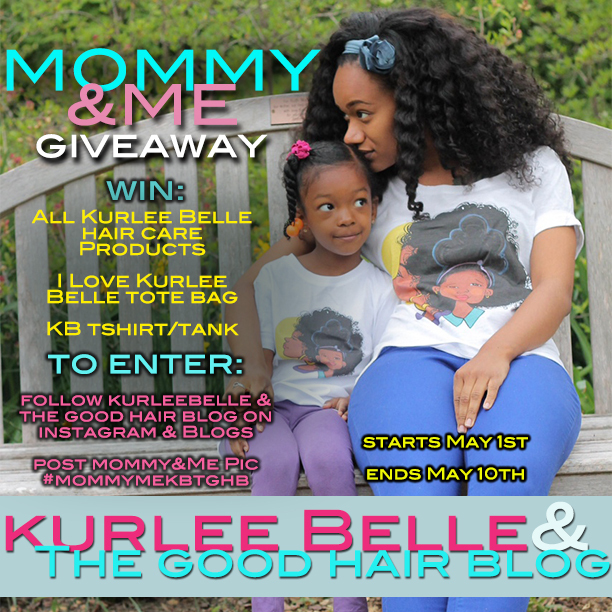 *If you are not on Instagram, send your pic to info@kurleebelle.com with the subject "Mommy & Me Giveaway". *Your photo will be posted to Kurlee Belle's Instagram page. The photo that receives the most likes wins. To increase your chances of winning, tell your friends and family to like your photo. *Winner will be chosen on May 10th. Contest starts May 1st. *All Kurlee Belle Natural Hair Care Products: Almond & Shea Butter Moisturizing Shampoo, Thirsty Kurls Leave-In Conditioner, Kurl Defining Creme, Banana Nut & Avocado Deep Treatement, and Kurlee Tropical Oils Blend. *Choice of KB T-shirt/Tank: Got Curls?, HNIC, Chic Classy Curly, or Kiss My Kurls. Comment below and join in the conversation! Memorial Day Sale: Two Products Only $23!!!!!! Charles Ramsey Our Natural Hair Hero!